Following last year's hype, the DDBT gang are back at it again. After the audiovisual adventure (screening and launching of their VCD) hosted by Studiorama at Kinosaurus (Compound Building, Kemang) on 19 March 2017, now they are set to run a micro-tour. Dentum Dansa Bawah Tanah is a sidestream / underground music compilation released by Pepaya Records on October 2016 in collaboration with Studiorama. The compilation features a few music units that never had a physical release before, such as REI, whoosah, Harvy Abdurachman, Baldi Calvianca, Sattle, Android18, Basement House, Sunmantra, Swarsaktya, Django, Maverick & Moustapha Spliff, Duck Dive, Future Collective, and John van der Mijl. 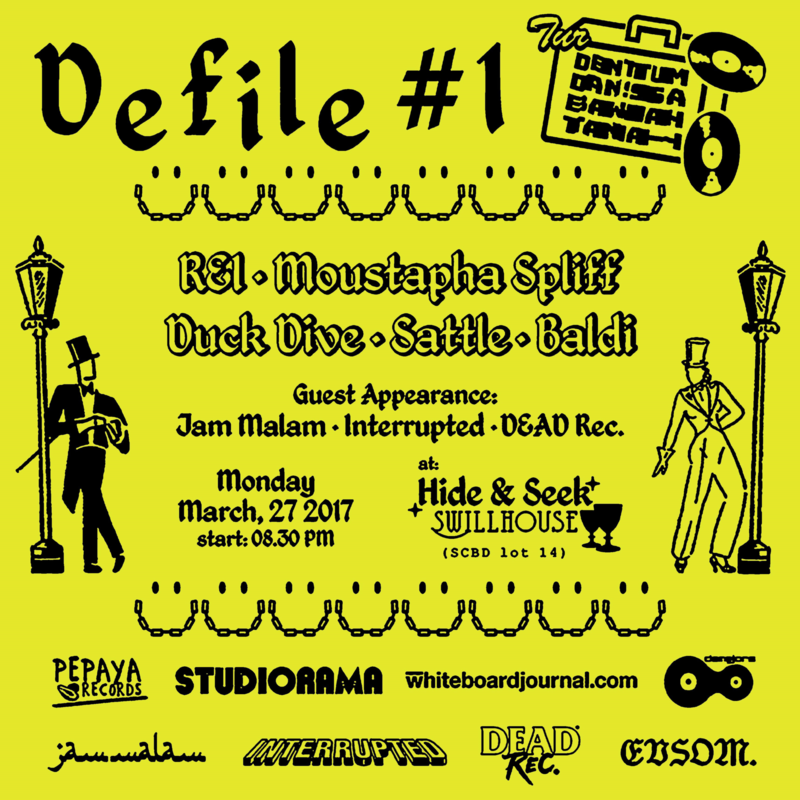 Starting tonight, these 14 music acts featured in DDBT are going to perform in a series of events by rotating the line-ups for several places and cities in the packaging of micro-tour called DEFILE. Why is it called so? According to the press release, the name was inspired by the procession line that moves to a specific direction towards the end. In every DEFILE event, all DDBT related products (CD, VCD and merchandise) will be available to purchase. The aim of this micro-tour is to promote Dentum Dansa Bawah Tanah program that has been released since October 2016. Dentum Dansa Bawah Tanah aims to document the sidestream and underground electronic music of the 2010-era, from various media and diverse activities.